Team Group shows off the Ultra L1, a new SATA 6Gbps SSD with a thickness of just 7mm, making it suitable for ultrabooks and ultraportable laptops. This new model is available in capacities of 60GB, 120GB, 240GB and 480GB. Depending on the capacity, it promises read speeds of up to 550MB/s, write speeds of up to 520MB/s and random 4k write performance of up to 80,000 IOPS. Solid state drive (SSD) is gradually making its way to become the mainstream in 3C product market. Team Group Inc., one of the leading memory manufacturers in the world, is making improvement in SSD product development by launching the ultra-thin Team Ultra L1 SSD. As thin as 7mm, the Team Ultra L1 SSD is the most lightweight and compact model which can be installed directly onto new generation of Ultrabooks for faster booting and read/write speed. Combined with the inherent advantage of shock resistance and stability of SSD, it signifies significant improvement of computer performance and durability. 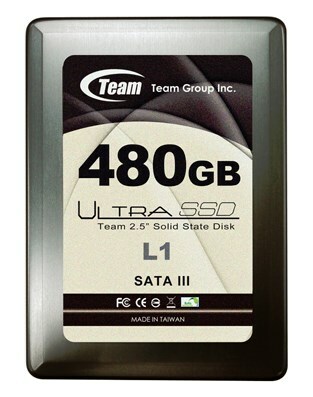 Team Ultra L1 SSD is provided with SATA III 6Gb/s high-speed interface. The compact profile and special titanium color finishing highlight the product’s high quality and the sense of modern technology. The continuous read and write speeds go as high as 550MB/s and 520MB/s, respectively. The random write-in speed for small files of 4K reaches up to 80,000 IOPS, not only fast but stable. In addition, the integration of Dura Write and RAISE (Redundant Array of Independent Silicon Elements) provides support for S.M.A.R.T. and full compatibility with Win7 Trim commands. It gives the hard drive a boost of burst random writing and effective improvement of computer’s ability to respond and multiplexing performance, making the hard drive a storage solution of extreme speed for consumers.